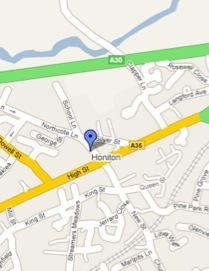 to Honiton Carpets, YOUR local Store located in the centre of the historic market town of Honiton. An unbeatable range of carpet and vinyl remnants, ready for you to take away- from a small piece for that downstairs loo to a much larger piece for your lounge, bedroom.or even your hall,stairs and landing. The store has a small number of dedicated staff that will be happy to get to know your needs, and provide you with the right advice to help you make the right choices for you. We have direct access to all the big name manufacturers at ultra competitive prices and with fast delivery! We are tucked away in Dolphin Court, right in the centre of Honiton, very close to Smiths, Somerfield and Lloyds Bank. We have Customer parking at the rear of the store, put our post code into your Sat Nav, or give us a ring (01404 47151) if you have any problems trying to find us. Honiton Carpets don’t just look after the needs of customers from Honiton and its surrounding towns and villages, but the whole of East Devon and beyond. Pop in and see what we can do for you. Mon - Fri 9am - 5.15pm. Sat 9am - 4.30. Closed Sundays.